An eatery that blends Indian food with Mexican fast food staples will be opening in Hunters Point by the end of this month. 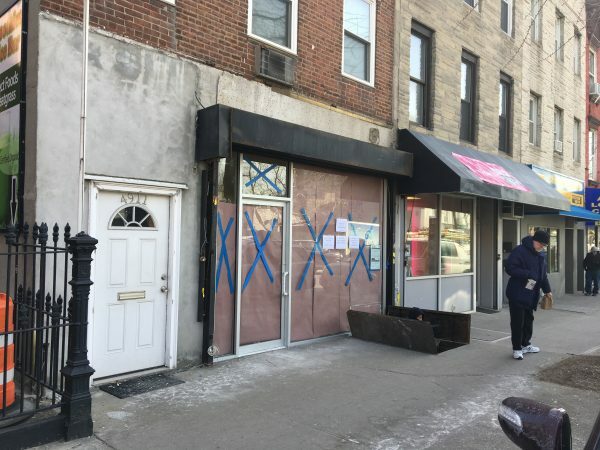 DesiBowl, the name of the site at 49-11 Vernon Blvd., will primarily offer build-your-own burritos and tacos with Indian-style meats, rices, and vegetables to choose from for lunch onward. In the morning, it will offer freshly made bagels, sandwiches, and American breakfast platters. Sabiha Uddin, the 31-year-old creator and owner of DesiBowl, left her medical financing job just half-a-block over at OptimEyes to open the food joint. Uddin was set on finding a place in Long Island City to open a small restaurant since she began working in the area four years ago. Finally, with the help of Terri Adams, the late civic leader, Uddin learned that the space once occupied by the Paris Health Cafe would be up for grabs. “It’s literally like an Indian-style Chipotle,” Uddin said. At lunch, diners can create their own burritos with a base like biryani rice, brown rice, or a salad. Meat options will include keema ground beef, chicken tikka masala, and a select seafood option of the day. A mixed vegetable curry will also be offered, along with toppings like chickpea and tomato salads and guacamole. From 6 a.m. to 10:30 a.m., however, the site will offer a “full blown American breakfast” menu centered on large, five ounce bagels made on premises. “I wanted to really use the location well,” Uddin said in choosing to include breakfast at her locale. Prices haven’t been fixed to the menu items yet, but everything will be under $8.00, Uddin said. DesiBowl is anticipated to open during the week of Jan. 20 as Uddin works on preparing the locale, but says the restaurant should be open no later than the end of January. The four-booth eatery will open from 6 a.m. to 11:30 p.m. every day, and will also offer free delivery. LIC Talk was first to report on DesiBowl. Maybe a Brazilian-Turkish place is in good order for the neighborhood? I truly wish them all the best, but I just don’t see the combo working. It isn’t too late to change the concept now that you’ve received responses on this website and on facebook. MISTAKES COST MONEY! Now this is exciting! We desperately need inexpensive lunches. It doesn’t sound like Mexican fusion. She’s using Indian flavors and ingredients, except for the guac, and making wraps out of them. That is pretty much in keeping with Indian fast food you can get in Curry Hill. If the food is fresh and well-prepared, she should do fine. I love Indian food and I love Mexican food. Good luck. I love spicy food – and this is good news for our area! Hope this restaurant will do well.